The production of (genuine) tequila is tightly regulated because tequila has denomination of origin status. This status (sometimes called appellation of origin) sets specific standards for producers in terms of how a product is grown or produced, processed and presented. Equally importantly, it defines the geographic indication, the specific places or regions where the product has to be made. Other items having denomination of origin status include champagne, asiago cheese and Melton Mowbray pork pies. 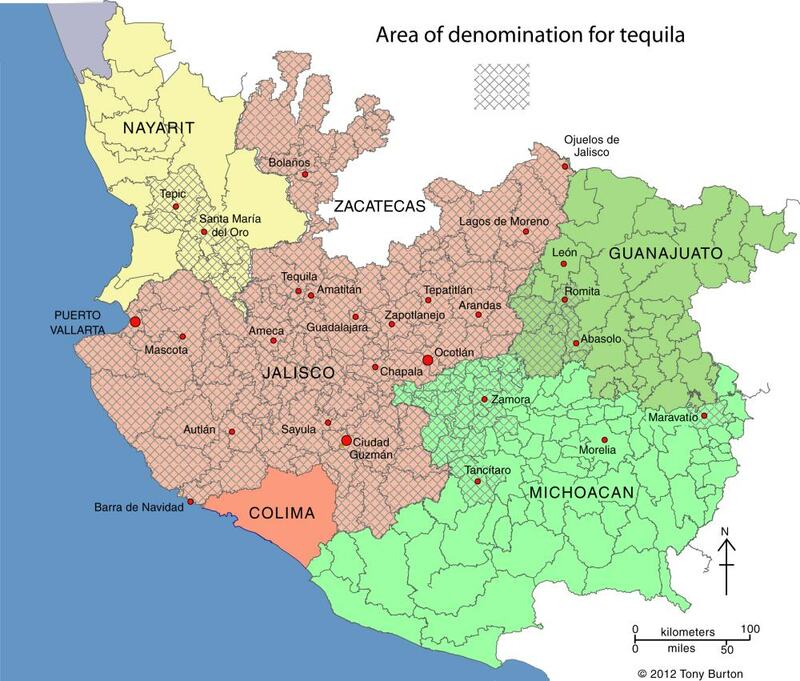 Mexico’s denomination of origin area for genuine tequila includes includes 180 municipalities in five states, a total area of about 11 million hectares (27 million acres). Nayarit (8 municipalities): Ahuacatlán, Amatlán de Cañas, Ixtlán del Río, Jala, Xalisco, San Pedro Lagunillas, Santa María del Oro and Tepic. Guanajuato (7 municipalities): Abasolo, Cd. Manuel Doblado, Cuerámaro, Huanimaro, Pénjamo, Purísima del Rincón and Romita. Michoacán (30 municipalities): Briseñas de Matamoros, Chavinda, Chilchota, Churintzio, Cotija, Ecuandureo, Jacona, Jiquilpan, Maravatío, Marcos Castellanos, Nuevo Parangaricutiro, Numarán, Pajacuarán, Peribán, La Piedad, Régules, Los Reyes, Sahuayo, Tancítaro, Tangamandapio, Tangancicuaro, Tanhuato, Tinguindín, Tocumbo, Venustiano Carranza, Villa Mar, Vista Hermosa, Yurécuaro, Zamora, and Zináparo. 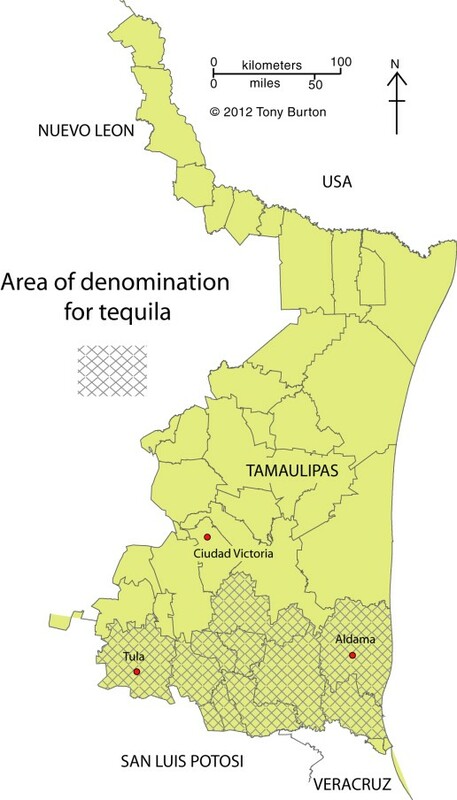 Tequila growing area in Tamaulipas. Credit: Tony Burton; all rights reserved. Click to enlarge. About 80% of all blue agave is grown in Jalisco, and almost all tequila distilleries are located in the state. The municipality of Maravatío in the eastern section of Michoacán is a tequila outlier, some distance away from the main producing area centered on Jalisco. The other major outlier is a group of 11 municipalities in the northern border state of Tamaulipas (see second map) where 11 municipalities (Aldama, Altamira, Antiguo Morelos, Gómez Farías, González, Llera, Mante, Nuevo Morelos, Ocampo, Tula and Xicotencatl) are included in the denomination of origin for tequila. The first denomination of origin for tequila was registered with the World Intellectual Property Organization in 1978. Since that time every trade agreement signed by Mexico has contained a clause to ensure that tequila’s special status is fully protected by the other signatories. Mexico has signed free trade agreements with more countries than any other country in the world. In 1996, Mexico succeeded in getting the World Trade Organization to recognize tequila, and also mezcal, as denomination of origin products. The following year, Mexico signed an agreement with the European Union whereby Mexico recognized 175 European spirits, including champagne, cognac, grappa and scotch, as having denomination of origin protection, in exchange for E.U. protection for tequila and mezcal. At that time, Mexico’s Tequila Regulatory Council (CRT) estimated that some 3.5 million liters of “pseudo-tequilas” were sold annually in Europe under such names as “Blue Tarantula” in Italy and “Hot Tequila” in Finland (In search of the blue agave: Tequla’s denomination of origin). Mexico’s footwear industry: intra-urban clustering for shoe retailing Dear President-elect Trump, the key ingredients of American Thanksgiving come from Mexico!